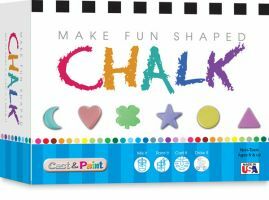 Sidewalk chalk art gets even more fun with this do-it-yourself kit; make a variety of fun shapes of chalk, then use them to draw a masterpiece! Follow the directions to make the colors shown, or mix the pigments up to get some truly outrageous chalk shades as unique as you are. Once they're made, use your new cool chalk shapes to make amazing art!